An agreement between Uruguay and Argentina has been reached to control pollution of the Finish Paper Mill Botnia, located in Uruguay. This agreement is supposed to set down the guidelines to prevent pollution of the Uruguay River. Although the Finish Paper Mill is located in Uruguay it makes use of the Uruguay River. The Uruguay River is a shared nature border between Argentina and Uruguay. It took 9 hours for this agreement to be signed. At the end of the agreement it was all fun and jokes. When the local Argentine paper La Nacion, asked Chancellor Timerman why the meeting had taken so long, Timerman answered, �Because Nacional and Pe�arol where playing�. National and Pe�arol are two Uruguay football teams. It seems it is all fun, games and jokes, however, if pollution hits this river it will be everything but funny. Like an unexpected and over anticipated chess move a source said, �We have a firm scientific base for the control works and monitoring, continuous measurements, temperature, turbidity, conductivity, installation of continuous transmission sensors, sampling of the effluents discharged into the river and installation for adequate continuous measurements�. How will these controls will be taken forward was left to be deciphered in a flow of unclear statements. The Bureau of Labor Statistics, kick off an online paper called, Taking note of the Paper Industry, with the words, "Consumer participation in recycling, improvements in technology, increased consumption of paper products and liberalization of international trade together have had an enormous influence on employment in paper-related industries." But lets break down this story. A few years ago, the Finish Company Botnia descended into South America and Uruguay and installed in agreement with Uruguay a Paper Mill. The paper mill as mentioned makes use of the Uruguay river to discharge its effluents. Since then it has been nothing but nightmares for Argentina. From demonstrations, bridge cut offs, transoceanic ranged demonstrations, agreements, meetings and more talks. �f the waters of the Uruguay river are polluted, which neighbours claim they have already been, the consequences to area will be vast. Argentina and Uruguay governments share a close relationship. However, in this sensible issue the edges are always smoothed off with diplomacy. The question to be asked is, where is Finish company representatives in this new agreement? Is this the way the Finish Paper Mill Botnia does business? It is no new news that companies seek land, rivers, resources and energy abroad. However, it is noteworthy, that the pollution agreements are left to be signed by the Argentina and Uruguay governments. After all the river is their river, Botnia is just using it to "wash its paper". One thing is certain this is not the last time we will get news from Botnia. 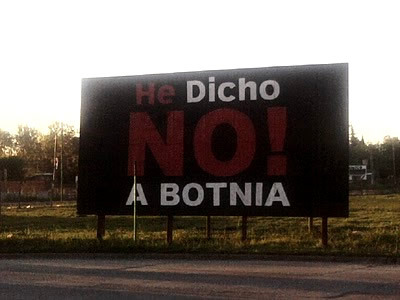 Image shows one of the many signs of campaigns against Botnia in Argentina. The image was taken in Argentina in Gualeguaychu where most of demonstrations occur. Image belongs to the Sun Maker. Image that heads the article shows local newspaper of Argentina today. 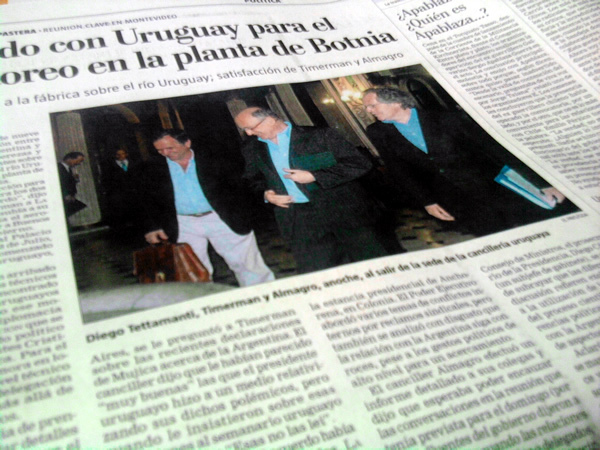 The story on the Paper Mill was the lead story of the two most selling newspaper in Argentina.